The RAVAS-110 is the cost-conscious solution for checking weights a few times a day, e.g. at goods reception or when filling out transport documents. Weights are shown in 2 lbs steps. 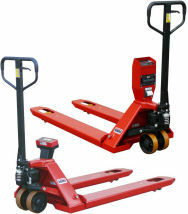 The RAVAS-310 is an advanced hand pallet truck scale with extended scale functions, such as a piece counting program and the possibility of adding an article or client number to each weight. The RAVAS-310 has a built-in printer and is standard NTEP approved legal-for-trade.